SPRINGFIELD, Mass. 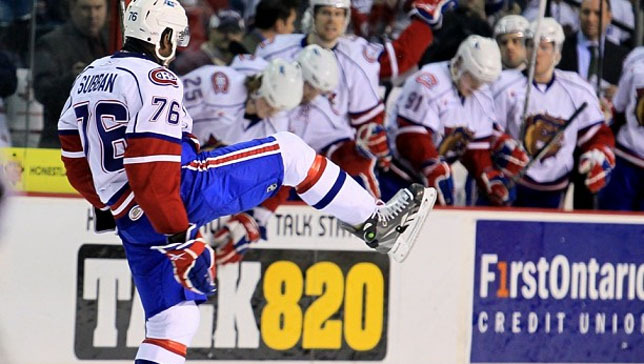 - The American Hockey League announced today that Hamilton Bulldogs defenceman P.K. Subban has been named to the 2009-10 AHL All-Rookie Team. The team consists of one goaltender, two defensemen and three forwards and was voted by AHL coaches, players and media in each of the 29 member cities. Subban, 20, leads all Bulldogs defencemen in points with 52 (18 goals, 34 assists) and leads all AHL rookie blue-liners in both goals (18) and points (52). The native of Toronto, Ontario ranks first among all league rookies with 11 power-play goals and is tied for first in the AHL with a plus-43 rating. The 5-foot-10, 195-pound blueliner participated in the 2010 AHL All-Star Classic and played in his first two NHL games with the Montreal Canadiens this season on February 12 and 13 recording an assist in each game. Montreal's second round, 43rd overall selection in the 2007 NHL Entry Draft has also set new franchise records for goals (18), power-play goals (11), and points (52) by a Bulldogs rearguard in a single season. Subban is the Bulldogs' fifth player and fourth defenceman named to the AHL All-Rookie Team in the franchise's 14 year history. Defenseman Craig Millar was named to the team in the 1996-97 season, defenceman Mike Komisarek in the 2002-03 season, defenseman Yannick Weber in the 2008-09 season and goaltender Jaroslav Halak in the 2006-2007 season. The 2009-10 AHL All-Rookie Team also includes Worcester Sharks goaltender Alex Stalock, Hershey Bears defenceman John Carlson, Worcester Sharks forward Logan Couture, Peoria Rivermen forward Lars Eller, and Portland Pirates forward Tyler Ennis. Each All-Rookie Team member will receive a custom designed crystal award in recognition of his selection to the 2009-10 AHL All-Rookie Team.